Carry a spare set of batteries for everything! I assumed I had full batteries in my flash, but I didn’t, so I was reduced to light painting with my mobile phone’s flash. My MIOPS was a god-send. It was 4 degrees C outside (~42 degrees F) and using the timed release feature, I was able to tee up two minute exposures without having to leave the car. It was awesome fun. On Monday night I went back out there (another hour and a half trip!) and re-shot the scene. I took care with my shutter speed and ISO, plus I brought two sets of batteries with me. I was much happier with the shot, as the stars were clear, the sky was nice (even less cloud cover than the night before) and the water tower (shown in the picture above) came out really well. On Tuesday night I went out to a different spot about 30 minutes in the opposite direction, to a dead tree by the side of a track. I was rather close to a power station (about 2-3km, as the crow flies) but the stars still shone. 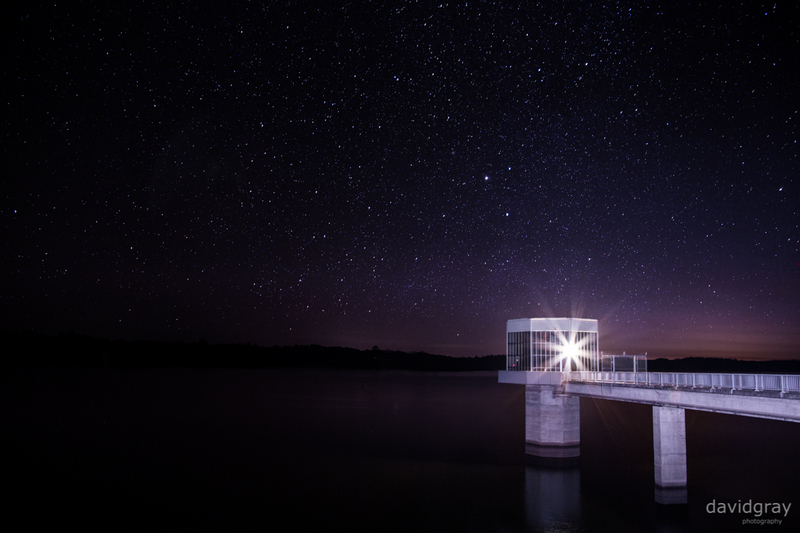 It was really dark and I had a dim flashlight, so I was unable to focus, like I was able out at Blue Rock Dam. Turns out there’s lots of great tricks on how to focus, including focusing your lens BEFORE you leave home (and marking the spot with tape) so when you get out there, you can focus with no worries at all. Very handy to know! In the end I got a few shots, but not exactly what I wanted. Tonight the weather turned sour, so looks like no more astrophotography for me until it fines up again. The dead tree out the back of town. Really tricky to focus, so I was barely able to see where I was shooting, plus my lens wasn’t wide enough to catch the whole tree.